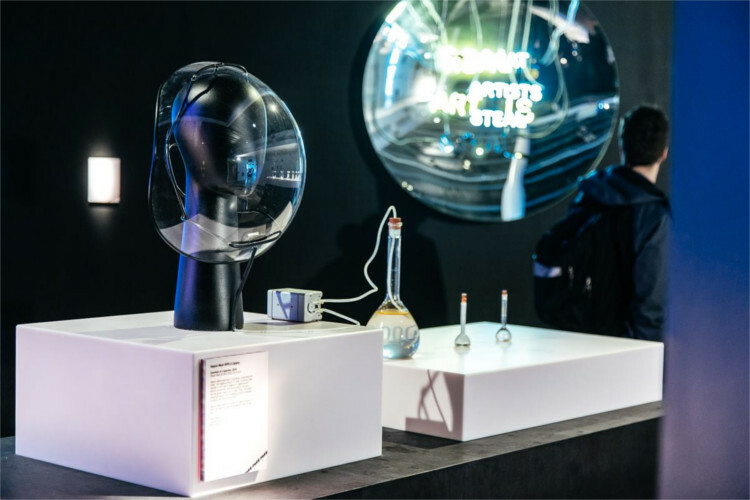 From biomimicry, to VR and decellularized pig hearts – Science Gallery latest exhibition explores the reality of FAKE in our world, challenging our perceptions on what it means to be fake and the stigmas it can hold. In recent times, the authenticity of our world is constantly being brought to the foreground of public discussion. Fake news, fake meat, and fake realities plague our news feeds – but just because something isn’t deemed as ‘the real thing’, does that automatically constitute it as less worthy? Science Gallery’s FAKE exhibition focuses in on this topic using visually interactive pieces to provoke thought and discussion behind this concept. Below are some of the highlights of the exhibition which explore the idea of what it really means to be fake. Fakery in the food world is more common than one may think. Step up to the Faux Foodmonger deli and you will experience this first-hand as the range of foods on display, to some degree or another, can be considered to be fake. Vegetarian octopus, vegan cheese, spam, gram crackers, Quorn ham slices and manuka honey are all available for sampling, along with several other ingredients that are alternated every day. You can even get a specialized sandwich made with the faux ingredients. While some of the products are glaringly obvious as to why they are fake – such as the infamous cheese in a can, others like manuka honey (which actually contains only about 30% manuka honey), might be less obvious. 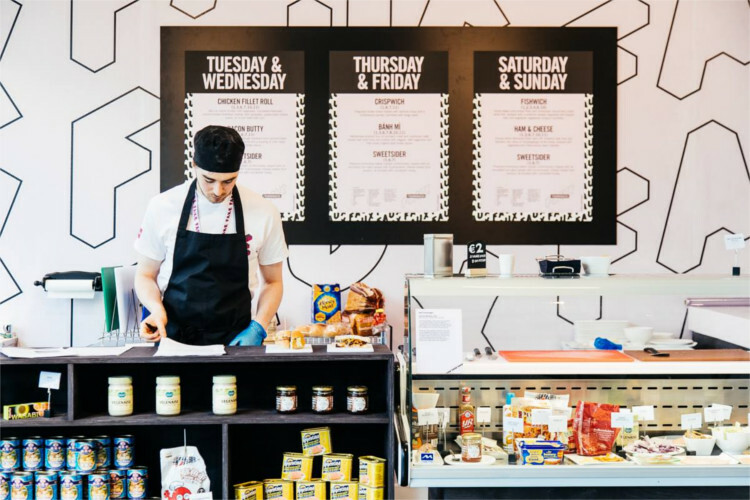 Faux Foodmongers is located just at the start of the exhibition and sets the tone well, with a mediator on-hand to facilitate disbelief and discussion. Don’t be put off by the formula name, the likelihood is that you are well- acquainted with vanillin, the chemical compound in vanilla beans that gives its distinctive taste. What you might be less familiar with is that most vanilla flavours out there, aren’t actually sourced from vanilla beans themselves but are brewed up in labs across Europe. As the vanilla orchid relies heavily on the painstaking method of hand-pollination to reproduce, only about 1% of global consumption of vanilla actually comes from the vanilla bean. To fill this market gap for vanillin, synthetic versions are mass produced – about 18,000 metric tonnes a year, most of which starts from the petrochemical precursor guaiacol. 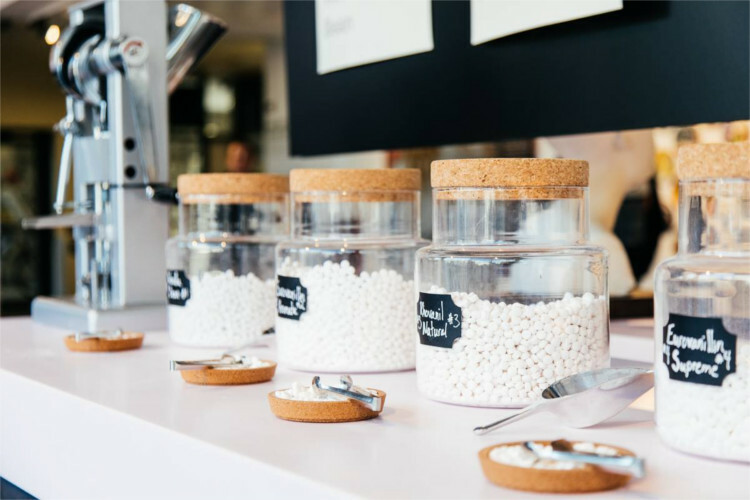 ‘Does Not Equal: C8H803’ allows visitors to taste test the different synthetic and natural vanillin flavours out there, complete with information on their market share, origins and chemical reactions of how its produced. Decide for yourself whether ‘au natural’ is your preferred taste or whether synthetics match the real thing just as well. In our lifetime, the possibility of seeing an extinct wooly mammoth or passenger pigeon is slowly becoming a more believable reality. De-extinction is the process of using genetic editing technologies such as CRISPR to revive an extinct species’ genomes within a close living relative. Currently, it is being studied extensively by the research group Revive & Restore, a break away from the cultural organization, The Long-Now Foundation. The Revive & Restore team has set ambitious goals of hatching the first passenger pigeon by 2025, the first of its kind after 100 years of human-induced extinction. 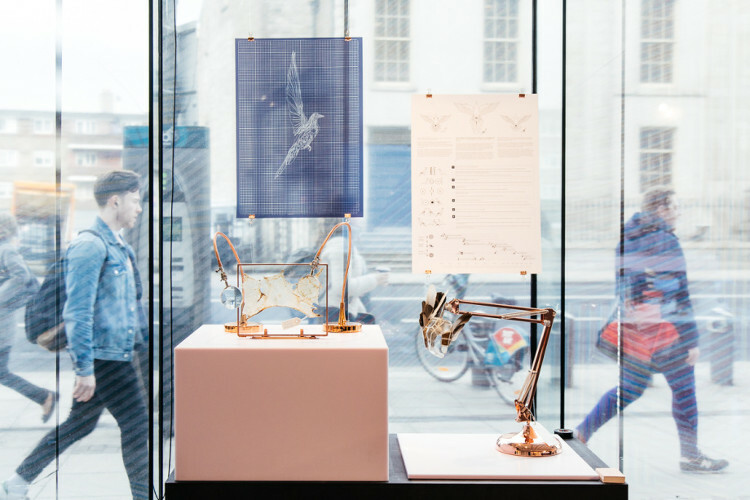 ‘Phylogenetic Atelier’ darkly ponders the future repercussions that the revival of the passenger pigeon may bring, emphasizing the flawed behavior of humans which led to the extinguishing of the species’ population in the first place. The piece in delicate rose-gold tinted hues, displays “passenger pigeon” leather – a now desirable and rare commodity among future societies, its preferred form in that of gloves for those affluent enough to afford it. Take a closer look at the pigeon leather with the magnifying lens and see what the real fate of bringing back extinct animals may look like. At first mention of decellularized pig hearts, many tend to recoil in disgust. However, on closer inspection it is a quite beautiful transformative process and one that holds great potential for medical advancements. In the upstairs gallery, an illuminated row of glass cases hangs models of pig hearts clad in different materials, from wax to felt. The centerpiece of the row encases the bare decellularized version of the pig heart, stripped of all its cellular contents leaving only a blank scaffold structure of the heart behind, soaking in ethanol for its own preservation. The artists Isaac Monté & Toby Kiers created a unique suite of designer hearts, emphasizing the capability of the decellularization process. If repopulated with stem cells, the process could lead to the personalization of human organs, tailored to our body’s needs. Check out the accompanying book on display to see more of the creative applications the artists employed using this unique process. With awareness surrounding animal welfare and the environmental impact of the meat industry becoming more mainstream, vegetarianism, veganism and general ethical consumption of meat is becoming more influential in people’s lifestyle choices. New technological engineered solutions are now coming online, providing lab grown or ‘clean meat’ for human consumption. But as technology progresses, it seems to be removing us further from other species entirely – the closeness of which has been so intrinsic to many cultures as far back as the human memory goes. The artists Devon Ward and Oron Catts wanted to realign our closeness with animals by creating a wearable helmet with a vaporized meat scent feature installed, the scent being derived from essential oils and small quantities of lab grown meat. While the helmet cannot be worn in the gallery, there is a timed vaporized demonstration of the helmet. Vapour Meat [HP0.3.1]alpha by Devon Ward and Oron Catts. This article only scratches the surface of what’s in store for us at FAKE. With several other pieces, talks and events to be explored such as the ‘De-extinction Dinner’ and ‘Forgay in Film’, the exhibition will no doubt keep us engaged and entertained for its duration. Ciara O'Flynn is an Environmental Science student at Trinity College Dublin, slowly trudging her way through final year. Stemming from her love of nature, Ciara is involved with the music festival ‘Open Ear’ as Environmental Officer and ambassador for Trinity’s own ethical clothing organisation, Nu. Currently, you can find her working in the Science Gallery, chit chatting away about her love of slow lorises to anyone that will listen.